I will introduce a new brand today and this is Nmf E aloe vera and vitamin E lotion. This product is also by Palsons Derma. Earlier I had reviewed their Sunmate sunscreen which is a really good powdery satiny gel sunscreen for oily skin. 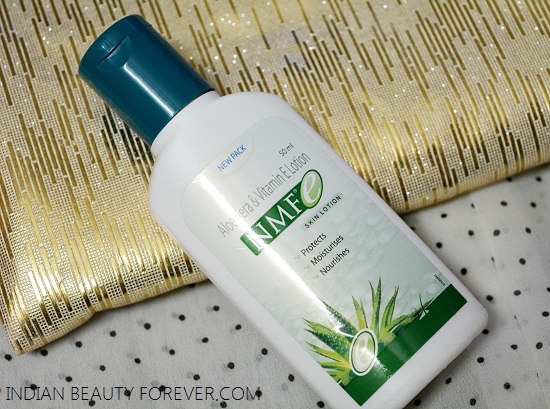 Price: Nmf E Aloe Vera and Vitamin E lotion is for 145 rupees for 100 ml. I have this small 50 ml sized pack which I find very cute and easy to carry around in a bag since it is a multi purpose lotion. 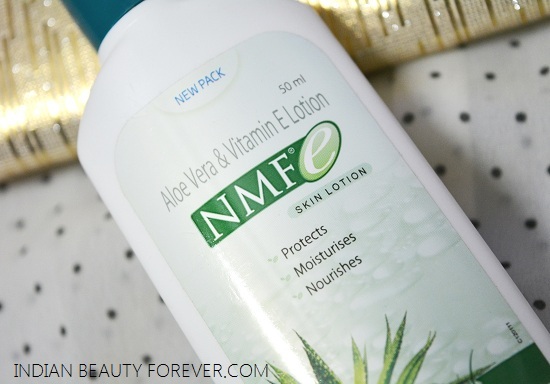 This Nmf E Aloe Vera and Vitamin E lotion comes in a tiny flattened bottle which has a sturdy flip top cap. I think the price for the 100 ml pack is quite affordable. This lotion has a smell which reminds me of a body lotion and very typical herbal smell it has. 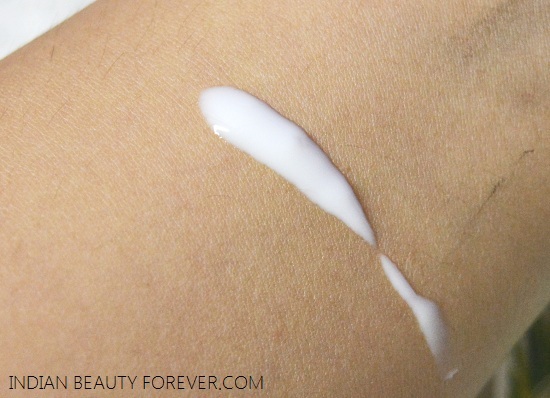 The lotion is a light creamish in color with a runny consistency. Now, as you may now dearies that aloe vera and vitamin E both are quite hydrating and skin rejuvenating substances. Aloe vera in fact heals the dry and irritated skin. I took a tiny drop of this lotion on the back of my hand. Yeah, that is my immediate testing ground whenever I get a new skin care product to review. :) This felt very light and very moisturizing. I rubbed it and it was very well absorbed by the skin. What amazed me was the hydration it gave. It’s a lotion hence it can be used on the face and body skin. so, I also tried it on my very dried feet and it instantly made them supple. At time we come across products which give superficial moisturization and after an hour may be our skin start to feel dry. But this lotion has given my dry skin moisturization for good 7 plus hours which I think is great as most of the products honestly won’t stay beyond that time. My face is combination and for the past few days, I have experienced that my cheeks are getting dry. I know its summer, yet they are dry, may be because of the acne medication that I am using. So, I also used this on the dry parts and this didn’t let me down. 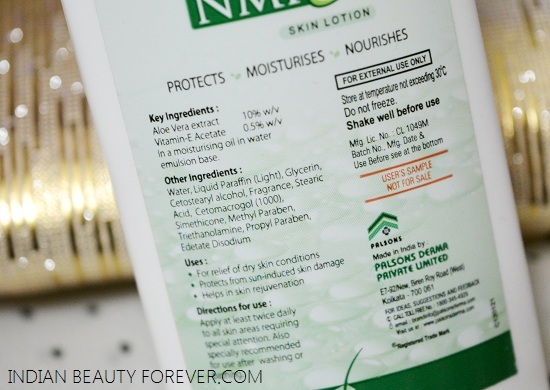 This is a good moisturizing option for dry sensitive skin or skin that is going through a bad phase when the skin gets irritated and dry, then this Nmf E Aloe Vera and Vitamin E lotion can be tried. There is nothing that I disliked about this product except for the fact that it has preservatives like parabens and the oily skinned people will probably won’t find it suitable as it can be more than enough on moisturisation for them. Take: Nmf E Aloe Vera and Vitamin E lotion is very moisturizing and has the goodness of skin soothing and healing ingredients like Vitamin E and aloe vera. I liked this product and would recommend this for the dry skin or skin that has rashes, irritation or any kind of dry patches. Availability is an issue for this product but I have seen this online on Flipkart if you really want to try, I have not seen this in medical shops yet, I think easy availability would make the product reach better. How can we buy through online...?